It’s tough for some bands to initially get off the ground and running. Take Italy’s Misthaven, who have been plugging away for a few years before finally releasing their debut full-length, Aces. The band may have faced some challenges and changes along the way, but they persevered, and now sit in a more comfortable position moving forward. The band’s rock/metal sound is one that can attach itself to fans of heavier music, and more alternative rock with equal compatibility, something that should give them some advantages as they continue. 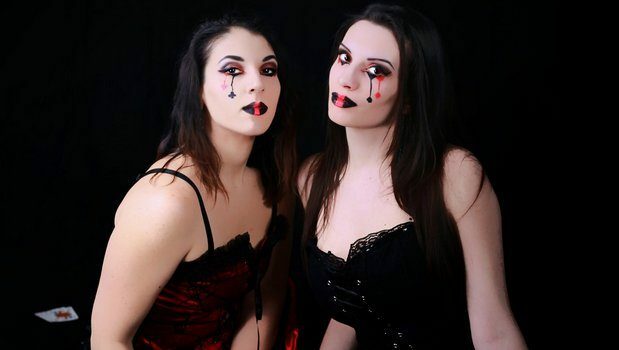 We fired off some email questions to vocalist Francesca and keyboardist Eleonora to get some more information about their debut and future plans. Dead Rhetoric: How do you feel that Misthaven has changed as a band in the few years leading up to Aces? Eleonora: Well, everything has changed so much since our beginning. First of all, we’re all grown up. I mean, not just literally, but also concerning the music. We finally took that path we’ve always known was meant for us, with a new well-defined sound. We had line-up changes as well and that also drove us to a particular direction. Francesca: We are just what we wanted to be when we started. It is like when you walk your own path and at one point you stop and look back. Then you see how far you’ve gone. We are just so proud of what we’ve become, talking about music and talking about band. Dead Rhetoric: What do you feel defines Aces as your debut full-length album? Eleonora: We never ran across so many difficulties as we did while working on Aces. It’s like video-games: if you meet enemies it means you’re in the right path. That’s why I feel Aces is our debut. Francesca: A new beginning, a bet, a complete brand-new work, maturity and self-consciousness. Yes. That is what it means to me. Dead Rhetoric: How would you describe the sound of Misthaven to potential fans? Eleonora: Alternative rock, sometimes hard, sometimes melodic, but always catchy and full of gothic orchestral atmospheres. Dead Rhetoric: Who are a few bands that you feel have inspired Misthaven as a band? Eleonora: Evanescence, of course. Halestorm, Within Temptation, the whole female fronted scene I’d say. But also Alter Bridge and HIM. We’re very absorbed by the entire alternative world. Dead Rhetoric: What can you say about the artwork of Aces? Francesca: I wanted to create something that could connect image and sound. Everything turns around the meaning of the album’s title. 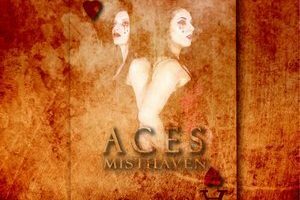 Aces, as in the game of poker, are the most important cards; so are our songs. We are showing the world our best so far. From this concept on, I wanted to give an image that could be fixed in all the listeners’ mind. Here’s why a warm color, orange, that even recalls fire and passion. Eleonora: Alter Bridge have always been one of our main influences and when I first heard our “Watch Over You” cover while rehearsing I thought it was too amazing to leave it unrecorded. So I pushed everyone to pick this song for the album. Dead Rhetoric: The album is out digitally – do you have plans for a physical (cd) release as well? Eleonora: Well, we’re open to the possibility but there are no plans. Dead Rhetoric: What challenges have you encountered in getting the band off the ground and running? Eleonora: Actually, if there was some challenge to encounter we sure did. Making this album was the hardest and at the same time the most amazing thing in the world. You know, stepping outside from a really little town makes things hard, and they get harder when you’re producing and financing the whole process all by yourself. But the worst part comes when you’re ready to record and you go through a whole line-up change, so you need to find musicians that aren’t going to betray the idea you have of the work you’re about to do on the music. Just to mention a few. I’m proud we’re here now. Francesca: We’ve been through so many troubles. It was hard but we never wanted to give up. And maybe that was the main challenge. Believe until the end and know that you have the possibility to do that. When you take your first step you know where you are headed but you don’t know how hard will be your path. Now we are at our first target. And we are just happy about it. Dead Rhetoric: What are your thoughts on the Italian music scene? Eleonora: I’m not a big fan of the Italian music scene, you know. I think it is still not very ready to open the doors to a new music view. Europe and overseas lands are. I feel like I need to clarify when artists are looking abroad it isn’t a matter of big expectations. It’s a matter of bigger acceptance. Francesca: I don’t like much Italian music either. I do listen to some Italian artists, but still, they are so far from us. Dead Rhetoric: Do you have any short or long term goals for Misthaven to achieve? Eleonora: Many, I’d say. Just to mention, we’re already thinking of a little European tour..
Francesca: …and maybe a videoclip! Dead Rhetoric: What plans do you have for Misthaven in the near future? Eleonora: Spreading our music all over the world! Francesca: Let our songs be sung!